BUCHAREST (Reuters) – EU antitrust regulators should consider forcing tech giants such as Google and Amazon to share their data with rivals rather than break them up, three academics enlisted by the European Commission said on Thursday. 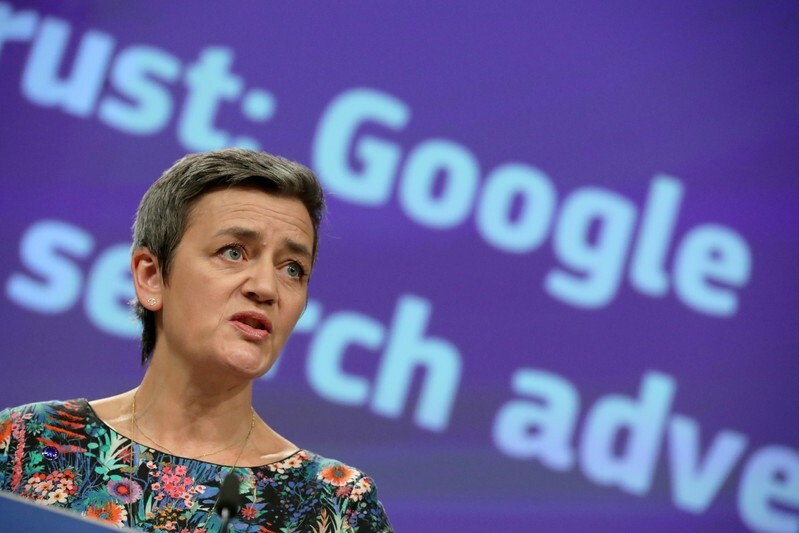 The academics, who were appointed by European Competition Commissioner Margrethe Vestager a year ago to look at digital challenges, also called for speedier investigations to deal with the rapid changes in technology markets. The advice comes against the backdrop of growing unease worldwide about the power of the likes of Google, Facebook, Amazon and Apple to analyze and process data to expand their dominance. Breaking up corporate giants has become a hot topic after U.S. democratic presidential contender Elizabeth Warren raised the issue. “In the digital age, having the right data may be one of the keys to compete,” Vestager told a conference organized by the Romanian competition agency. The academics said that making it easier for companies to move data to competing platforms could be a solution to rein in tech giants. “Requiring dominant players to ensure data interoperability may be an attractive and efficient alternative to calling for the break-up of firms – a way that allows us to continue to benefit from the efficiencies of integration,” they said in their report. Vestager said she would review the non-binding recommendations before deciding on the next step. On the issue of companies buying smaller rivals to shut them down, known as killer acquisitions, the academics suggested that enforcers should strengthen and overhaul their arguments why some companies acquiring another in a different but closely related market could harm competition. They dismissed calls by some for tech giants, such as Google, to be characterized as an essential utility required to provide reasonable use of its service. “We do not envision a new type of ‘public utility’ regulation to emerge for the digital economy. The risks associated with such a regime – rigidity, lack of flexibility, and risk of capture – are too high,” they said. The academics are Humboldt University law professor Heike Schweitzer, Toulouse School of Economics professor Jacques Cremer and Imperial College London’s assistant professor of data science Yves-Alexandre de Montjoye.